Pineapple Open Face Chinese Poker – POFC for short - has been on the rise in card rooms, online, and in the app stores over the last couple of years. Currently, I count 23 Open Face apps or websites that you can play on either for free, for real money, or even for bitcoins. I first discovered the game about 18 months ago, and after playing a few sessions, I knew it was a game worth diving into. While traditional Open Face was fun and challenging, there never seemed to be enough “gamble” to it. But the Pineapple variant seems to be the perfect blend of gamble, variance, strategy, and dumb luck; I often call it the PLO of Open Face. And it’s this sweet spot of game design that is driving thousands of new players to get addicted to the game. If you haven’t played before, I suggest you check out the rules here, and consider downloading one of the many free apps for your phone, or playing on a free money site. At first, the game takes a little guesswork and figuring out, but the beauty of the game is in its simplicity and its sharp learning curve. If you already know poker rankings (flush beats straight, etc.) then you know the basics of Open Face. Now you just have to try not to foul, and remember your royalty payouts, and you are ready to go. Ironically, that is how most poker players picked up the game; they just started playing and learned through experience. But I am here to tell you there is a better way… After playing the game for a little while you might come across a spot like this: 1. You might have an idea on which play is the best, but it’s a rather complicated spot, and really tough to tell whether we should set ourselves “all-in” with a shot at FantasyLand (K♣ Front, 6♠ Back) or play it safe (2♦ Front, 6♠ Back). And what happens if we change the situation ever so slightly: 2. In order to get the solution to these problems, you could try and run out some heavy math with a calculator and pencil and paper (or Excel), but that would take a lot of work and a long time, and you still wouldn’t have a very accurate solution because of all of the possibilities of how our opponent’s hand can play out. That is why I was compelled to create a simulator for the game and open it up to the public for anyone to use. Situations like this are completely solvable using combinatorical simulators, and there is no reason why we all can’t learn a thing or two together and take our game to the next level. So what did the simulator tell me are the answers here? (FantasyLand valued at 7.5 points) K♣ Front, 6♠ Bottom -.14 2♦ Front, 6♠ Bottom -1.13 [leftpull]It’s a clear gamble here, and playing it safe would cost you an average of 1 point. You may wonder, “What’s the big deal with making a mistake of 1 point?” But if you are playing for real money, it can be quite a costly mistake. And even if you are just playing for fun, it’s a lot to give up if you keep making the same mistakes over and over again. And as for the second problem:[/leftpull] 2♦ Front, 6♠ Bottom -.94 K♣ Front, 6♠ Bottom -2.13 With one more out dead it’s now correct to play it safe. And this is what makes Pineapple Open Face such a great game. Complex decisions are balancing on very fragile information. It’s not just whether a couple of key cards are live or dead, but also what our opponent’s board looks like, whether we are scooping them or not, and even knowing how likely they are to have thrown away some of your outs. This is where strong intuition and advanced strategies come into play. While in this spot you could say, “Well, it’s settled then, with 5 outs I can gamble for FantasyLand, but with 4 I can’t,” I could show you another very similar spot where 5 outs isn’t even enough, or where 4 outs is still a FantasyLand gamble! It’s not enough to live by cut and dry rules in this game. It’s just like in poker, you may know the odds of a flush hitting with 1 card to come, but that doesn’t mean you know what play is going to net you the most money long-term. To join me in this epic journey of learning perfect Pineapple Open Face Chinese strategy, you can click here for more information on our simulator and web apps. We are also creating a unique rating system to let you see where you stack up against the competition. And for news and updates related to OFC and Pineapple OFC head over to our sister site: OpenFaceStrategy.com. Take a peak and let me know what you think. Derric “SixPeppers” Haynie is the author of Quantum Poker and creator of Open Face Solutions.com – Your Pineapple Open Face Chinese Headquarters. 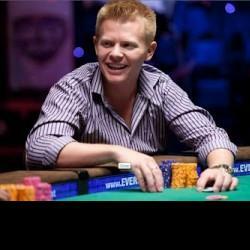 Check out his site for more articles, quizzes, solutions, tactics, and information on Open-Face Chinese Poker.